The registers of many Nonconformist churches only recorded baptisms and burials, although a few did include marriages. However, when your family history search takes you into Nonconformist marriages perhaps the main point you should be aware of is the fact that between 1754 and 1837, marriages that weren't conducted by the Church of England, Quakers or Jews weren't illegal as such - they simply weren't valid. Obviously, that would be the main reason Nonconformist marriages weren't generally recorded (and probably relatively few conducted). However, from records it does appear that some among the faithful did marry within their religion, which makes this an avenue worth pursuing, although in all likelihood you'll come to a roaring dead end in any genealogy search. The biggest change with marriage records for both Quakers and Jews came in 1837, when they moved to a printed marriage form that gave the same information as found in civil marriage registers - an excellent source for family tree material. However, the Quakers had long since had a custom of all attendees at the wedding signing as witnesses, and continued it on their form (although there was no statement of their relationship to the bride and groom, unfortunately for those involved in family history). Formal witnesses are also named in Roman Catholic marriage registers, But unfortunately for genealogy, pitifully few survive, in large part due to the persecution of Catholics in England for many years. That said, post-1850 you might be able to find marriage transcripts in the hands of the relevant diocesan authority. 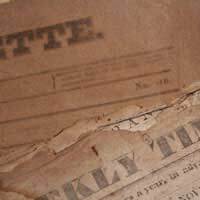 Another good genealogy source for Nonconformist marriage records of all types, especially in the 18th century among the middle and upper class, is newspaper notices, the forerunners of today's marriage notices. These can be remarkably useful in family history information, with not only names of bride and groom and the date and place of the marriage, but also parents' names, and in some cases estimates of the amount of the dowry! Perhaps even more remarkable (at least to modern eyes) are the notices of elopement, which also list the bride's maiden name (again, wonderful if you're putting together a family tree on an ancestor). If you're compiling a family tree a family that possesses a coat of arms, they can offer great clues as to marriage. The coats of arms of a wife would be incorporated, and from that you can discover her family. You can even find the evidence of a remarriage in the "hatchment," a diamond shape used by heralds. A wife's crest was only carried on in her husband's crest is she was, or became, the heiress to a family with its own crest. Then it would continue into the next generation. When you find "married abroad" in a Nonconformist marriage register, don't necessarily assume it means overseas. The phrase was commonly used to simply mean married in another parish, so you can undertake your genealogy search in the wider area. However, should you suspect the meaning to be literal, probably your first port of call on research into the ancestor should be the International Genealogical Index. The biggest problem to anyone working in genealogy records from two or three centuries ago is spelling. If the name of the bride or groom was written down wrongly, you might be able to check the actual signatures. However, as illiteracy was high, many just made their marks. But it's still worth looking if you believe the certificate should be there.